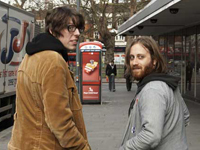 The two-man duo comprising the Black Keys, singer/guitarist Dan Auerbach and drummer Patrick Carney, were in their early twenties when their debut, The Big Come Up, was issued in 2002. From Akron, OH, they play close-to-the-bone, raw blues-rock, the only instrumentation being Auerbach’s guitar, Carney’s drums, and the occasional organ. Auerbach had a fine, mature, lived-in blues voice for one so young, and the group’s material worked in funk, soul, and rock influences from the likes of Jimi Hendrix and James Brown that avoided undue repetition of the overdone chord progressions and stock riffs common to so many such acts. Before the year’s end, the band inked a deal with Fat Possum.